Dropping off your chili at the Sailing Center will be challenging tomorrow morning. There are several events in the Sailing Center Saturday. The classroom will have activity from the Mallory Cup qualifiers and three youth sailing group practices. The Sailing Center let’s us use the classroom as a curtesy and has asked us not to disrupt ongoing events. The most optimistic estimate for access to plug-in your chili crock pot is 10 AM. If there is a hold over from one of the groups it could be later. With an 11 AM Race start this could be tight. You will be taking a chance with this approach. And please remember: Hungry kids will be in there, some form of a “hands off” deterrent is advised! A way to circumvent this issue: Consider a pre-cooked chili that just needs to be warmed up or finish cooking. We expect to be back at the docks around 2 PM and you could run your chili into the classroom quickly leaving a 1.5 to 2 hour warming or final cooking time. The eating begins approximately 4 PM. This entry was posted in News on April 19, 2019 by admin. Here’s your list of upcoming SPSA events. Saturday April 20th Chili Cook-Off following the Race (roughly 3:30 – 4 PM) at the Sailing Center. Bring your pride winning chili or your appetite. Or bring both. We will even have a vegan entry! Note: This Friday, April 19th a Twilight Series Race is doubtful because nasty nasty nasty weather is forecast. Coming in June: A safety Seminar – stay tuned for more information. This entry was posted in News on April 17, 2019 by admin. If you are interested in getting on a race boat in one or more of the Friday Twilight races, let Dan Dawson know the dates you are available and he will find a boat for you. Several of the race boats have extra spots available and would enjoy having you on board. Come out and enjoy the fun! Click the link and shoot Dan Dawson an email. This entry was posted in News on April 2, 2019 by admin. Twilight Series Racers are looking for crew this Friday – TOMORROW! Let Dan Dawson know if you if you would like a crew spot spot in Fridays 6:30 Twilight Series Race. We have members looking for crew for tomorrow as well as other Fridays all summer long. Come out for a magical evening on the water. The only thing better than the sunsets are the friends you will make. Conrad is an SPSA member who is looking for crew to join him on his 35 foot sloop on day sails. He’d also like to do some overnight cruising along the Florida coast. He is an extremely competent, experienced sailor with a calm and enjoyable personality. Men, women or couples are encouraged to contact him to enjoy some casual cruising. One More Thing. 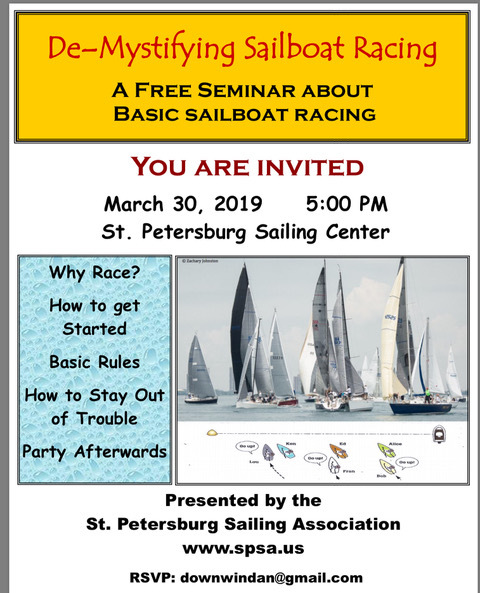 Don’t forget about our free Sailing Seminar, Saturday at 5 in the Sailing Center and post seminar party at Courigans. This entry was posted in News on March 28, 2019 by admin. This entry was posted in News on March 25, 2019 by admin.